Mudjacking is pumping grout underneath sunken concrete slabs to restore them to their original grade. It’s as simple as 1, 2, 3! A pattern of 1-5/8” holes are drilled through the sunken slab of concrete. A grout mixture is pumped underneath the slab using our specialized equipment. 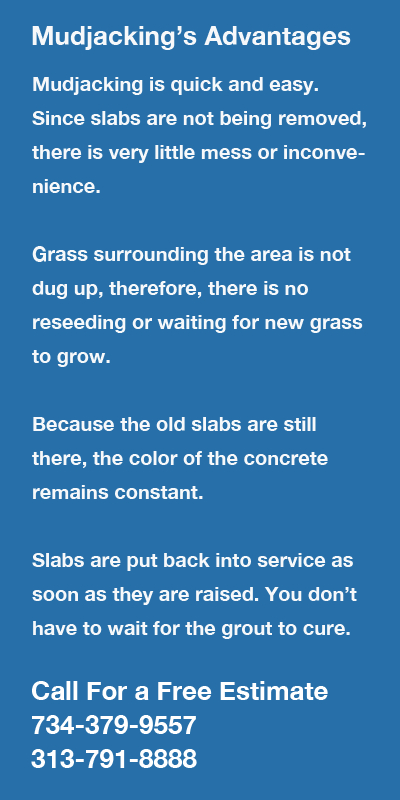 Once any void is filled, the grout becomes pressurized, hydraulically raising the slab to its proper height. Once the job is complete, these holes will be filled with concrete. Mudjacking is an efficient, affordable option to replacing concrete. Call Accurate Concrete Raising today for a free estimate: 313-791-8888 or 734-379-9557, or use our handy contact form.